All right, so it's an age thing. But it's also a sensory thing. Granted, Compact Discs offer music which is gloriously free of clicks, hisses and crackle; but somehow a CD looks and feels less satisfying than does its vinyl equivalent. Nowadays most CDs come with their own unique label design, but in the vinyl era standard record labels and uniform 7" company sleeves helped to establish a record company's identity. Would early Vertigo records be so popular with collectors nowadays if it wasn't for the black and white 'swirl' label, which they have in common? Of course, not every label was as well known or as successful as Vertigo. For every company that lasted for years and issued hundreds of records there were dozens which only managed to put a handful of singles out before expiring. It is to the people behind these lesser companies that this site is dedicated. As far as success is concerned, their high hopes may soon have turned to low moans, but by their efforts they have provided me with a hugely enjoyable hobby - trying to track down examples of their product. That I am not an expert in record company history will soon become apparent; for goodness' sake don't take anything in these pages as gospel. My only intention, when I started out, was to try to provide pictures of as many of the record labels of the 1970s as possible, together with a few scanty scraps of information about them. It soon became apparent that even this basic aim was too ambitious. The number of Reggae, Punk and New Wave labels which put records out during that decade was astronomical; and, thirty years on, even when examples are available they are horribly expensive - I don't mind shelling out a fiver for to get hold of a new label for the site, but spending tens of pounds for a here-today-gone-tomorrow Punk label? It just wasn't on. So I had to lower my sights. The revised aim was to give every label that issued singles in the '70s at least a mention, with a note as to what kind of music came out on it. Anything more than that - pictures, discographies, the kind of company history that you could fit onto the back of a stamp - was a bonus. I have excluded two kinds of records: those made as promotional tools for firms outside the music business such as Barclays Bank or the Burnley Building Society, on the grounds that they're not proper labels (though examples can be found on the pages of the record company through which they were made, Lyntone being a prime example); and flexidiscs, because the vast majority were promotional items and were given away. The occasional vinyl record promoting a business has been allowed to slip through, either on the grounds of exceptional interest or because they have been given a catalogue number outside the series used by the record company through which they were made. 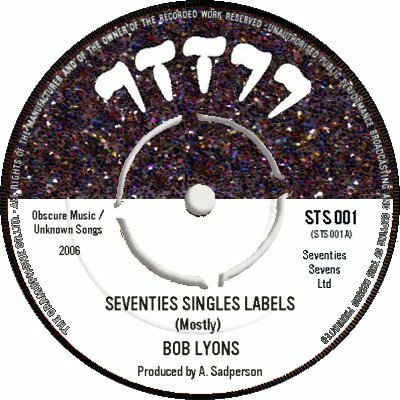 I have tried to only include labels which appeared on 7" singles in the United Kingdom. An LP label may have occasionally slipped in, for the purposes of comparison. On many occasions I haven't been able to get hold of a picture of a label at all; wherever possible I have tried to provide links to sites where a picture of it can be found. There are several outstanding sites for music; to mention only a few the 45cat site has been set up for the purpose of listing, and providing pictures of, as many vinyl singles as possible, from all over the world; it has still got a long way to go to achieve that admirable (and daunting!) aim, but it is well worth a browse, and contributions are always welcome. Discogs.com includes album as well as singles, and has a buying / selling facility; I can't get a link to work but you can easily google it. Seventies Sevens does not cover labels from the Republic of Ireland, but those who are interested in Irish labels can find many interesting illustrations on the Irish Showbands site, while for Punk enthusiasts Bored Teenagers has lots of stuff on obscure labels and on the bands which owned and operated them. Whenever the bulk of my information has been gleaned from one particular site I have mentioned it at the end of the text. Often the same information has appeared on many different sites; I haven't given any references in those cases, in order to save space and to avoid sending the reader off on a needless chase, but both Wikipedia and Answers were useful on many of those occasions. Chart information comes from 'The Guinness Book Of British Hit Singles 4', by Jo & Tim Rice, Paul Gambaccini and Mike Read. Details about record company affiliations, distributors and release dates have in the main been taken from various 'Music Master' catalogues, published by John Humphries - an invaluable source for anybody interested in '70s records, despite the fact that they generally just list 'A' sides of singles. Most of the discographies on this site have been put together with the help of those catalogues, which explains the lack of 'B' sides in them; others are the result of hours and hours of mindless googling and my failure to get a life. I have avoided lifting discographies wholesale from other sites, as it seemed like cheating; where I have used them to fill-in gaps in my own research I have stated so. In a similar vein, I don't mind people borrowing stuff from this site, but an acknowledgement would be nice. Needless to say, additions and corrections will be welcome; scans of missing labels especially. I find that 400 x 440 (in jpeg format) for labels, and 500 x 500 for sleeves, combines ease of handling with legibility. This site is reachable via 7tt77@tiscali.co.uk.